I’ve been posting some article about D Link router a while ago, but not how to configure the router from the start. What I mean is to setup D Link router out of the box. I’ll just cover how to block websites, change the router password and how to know if somebody connected in your wireless network. To learn how to configure D Link router, I write down the steps and include a screenshot for you. Please note that I am using my old D Link DIR 300 router to make this tutorial. The procedure is almost the same to other model of D Link since I am using the wizard setup. This is the easy and simple way to configure your router. Ok, let’s start, First step is to access the admin page of the router. Open up your favorite browser and type in 192.168.0.1 in the address bar, this is the default IP address of D Link router. This will open the admin page of the router asking to enter the username and password. The default username is “admin” without the quote and the password, leave it blank, then press enter or click the login button. If it doesn’t open you can check the default router password and IP address in this list. 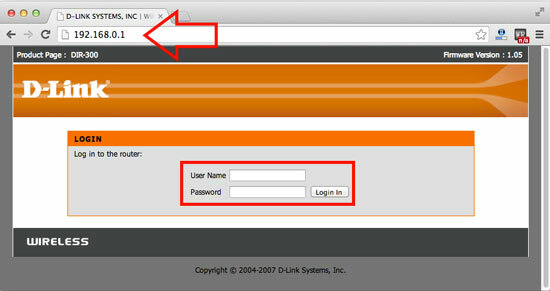 Now that you’re inside of your router’s admin page, you can start configuring your D Link Router. Inside “Setup” menu, click “Internet Setup” at the left side of the page, then click “Internet Connection Setup Wizard” button to launch the setup wizard for your Internet connection. Once you click Internet Connection Setup Wizard button, a new window will open listing 4 step wizard guide to configure your D Link Router, click next. To Setup your router follows the infographic attached below. Now that you finished configuring your router for Internet connection, try to open a website like Google or Facebook to check if properly configure. If you can’t connect to any website or your browser says no internet connection, it means that you didn’t configure your D Link router correctly in the internet setup wizard. Go back to setup wizard and double check your configuration. If you can browse websites follow the steps below to configure your wireless router. To be able to connect wirelessly using your wireless router you also need to setup your router. Don’t worry, it’s also easy. On the “Setup” menu, on the left just below the Internet Setup you clicked a while ago, you will find the “Wireless Setup” click on that to start the setup. A new window will appear listing the two steps to setup your wireless router, click next to start the setup. In this step, you can enter your Wireless Network Name or the Service Set Identifier (SSID) for ordinary people they call it WiFi name, this is the name you see when you scan for available wireless network using your laptop, tablet, smartphone, etc. Here you can also select whether you manually select your network key or the password or your router automatically assign to the key. I’ll choose the “Manually assign network key” to easily remember the password. See the screenshot. Type your network password then click next. Congratulations! You’re now finished configuring your D Link Router, copy or memorize all the information specially the network key or the password of your wireless network.